SSP needed to find a solution to share and deconflict spectrum and to redesign existing test equipment for shared spectrum usage. SSP needed to significantly increase data transmission rates within assigned spectrum in order to perform more robust system testing. The program had to obtain spectrum authorization in foreign countries. The program had to develop spectrum usage plans for multiple systems for flight test operations. 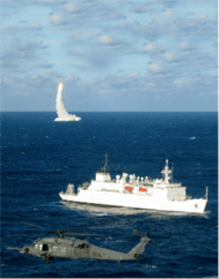 JRC engineers developed a spectrum coordination process among Navy Marine Corps Spectrum Center (NMSC), National Telecommunications and Information Administration (NTIA), and seven Navy Marine Corps Spectrum Offices (NMSO). JRC developed a Host Nation Coordination (HNC) for military frequency allocation. JRC coordinated equipment authorization from NTIA and temporary frequency allocation from NMSC. JRC developed comprehensive flight test plans for frequency and spectrum management for ballistic missile flight tests. SSP overcame equipment obsolescence and significantly increased test system capabilities. The program had reduced test costs. SSP had a 100% on-time test performance.